Over 300 freemasons were among those slaughtered in Andalucia during the Francoist holocaust. 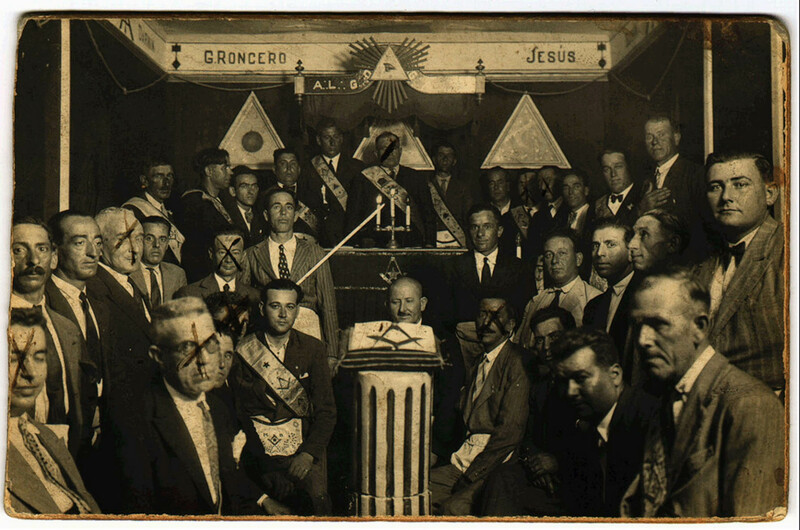 The photograph is of members of Lodge Germinal 96” of San Roque (Cádiz); those marked with crosses were shot. Reports of a military coup having been launched in Africa reached Cadiz by nightfall on Friday, 17 July. The civil governor, the pro-Azaña soldier Mariano Zapico, took a number of steps to quash it. One such step was the arrest of the Carlist general Enrique Varela and the summoning of a meeting of civilian forces. The anarcho-syndicalists turned out for the latter. Since the autumn of 1935, the CNT, reeling for repression and divided over the failed uprisings in 1933, had decided to call a truce with the republican regime. Following the Popular Front election victory and the swelling rumours of a coup d’état, a National Plenum of CNT Regionals had recommended to the unions, that one came to pass, they should act in concert with other political factions and. Only in the event of there being an opening for a revolutionary process, overtaking them. The Cadiz local federation of the CNT did just that. During the morning of Saturday 18 July 1936 it worked alongside the republican authorities, the PSOE and the PCE to lay the groundwork for resistance. Once the coup unfolded, the CNT’s leading militants could be found at the Civil Government and, later, in the middle of the street fighting. Such was the unity of action that the pamphlet issued by the Local Confederal Defence Committee on the afternoon of Saturday 18 July was on its way to the printers. It was during those early hours that one of the most outstanding local anarcho-syndicalists met his end: this was José Bonat Ortega. Born in June 1890, he was a wood-carver by trade. 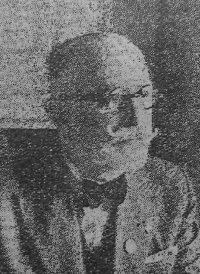 Between 1916 and 1919 he was one of the founders of the CNT unions in Cadiz. He was an active anarchist and was behind local newspapers such as Rebelión and Bandera Libre and he wrote for the nationwide anarchist press. After the proclamation of the Second Republic, he chaired the Economic Defence Commission; in October 1931, it called the very first general strike in the city to press for a cut in rents. The crackdown on that strike, entailing his being charged with atentado, prompted him to leave the city. For some months, he lived in Seville where he was hauled before a council of war for anti-militarist propaganda activity. On his return to Cadiz he rented a carpentry workshop in the Libertad market that he ran and in which he worked. Between then and 1936 the main focus of his activity was the Prisoners’ Aid Committee, charged with looking after imprisoned members. His death was the first unfolding of the coup d’état. At around 4.00 p.m. on 18 July, José Bonat was crossing the Plaza de la Libertad. The golpistas had just proclaimed a state of war. He was coming from his home in the Calle San Bernardo and making either for the CNT union premises in the Plaza de Candelaria or the Civil Government building. No matter which, he never arrived. As he came to the junction with the Calle Hospital de Mujeres, a shot rang out from behind a house shutter. He fell to the ground and died on the spot. He was buried on 22 July, reported as having died at home. He was the first prominent anarcho-syndicalist to be murdered. Heading a list of virtually the entire “high command” of the Cadiz CNT. Even though they succeeded in Cadiz, the golpistas had failed on the national stage. Resistance was greater than expected and there was even a revolutionary process launched which radically altered the economic and social situation. The coup’s organisers had played down any backlash they might encounter. In Cadiz, for instance, almost two dozen people perished during the occupation. In the wake of their victory, the repression continued to be enforced by means of increasingly harsh war proclamations. What we might term War Proclamation Enforcement (henceforth WPE). In Cadiz, even though several killings had already been carried out, the slaughter began with the arrival of civil governor Eduardo Varela Valverde on 6 August. That same day, the leading authorities of the city, arrested on 19 July, were executed. Among the CNT personnel murdered that month were the brothers Alvaro Quirós brothers and Manuel López Moreno. Three of the city’s leading trade unionists. In Manuel López’s case, he was also one of the best known anarchists in the city; he was held answerable, along with the civil governor and an Assault Guard captain, for organising the resistance. The Alvaro Quirós brothers were metalworkers. 33 year-old Celestino was a lathe-operator and Jose a boiler-maker. Celestino was secretary of the CNT’s powerful Metalworkers’ Union. 1920s and had been one of the most active anarchists since the 1920s and a regular lecturer and speaker at anarcho-syndicalist meetings during the republican era. Along with his wife, he ran a newspaper kiosk. 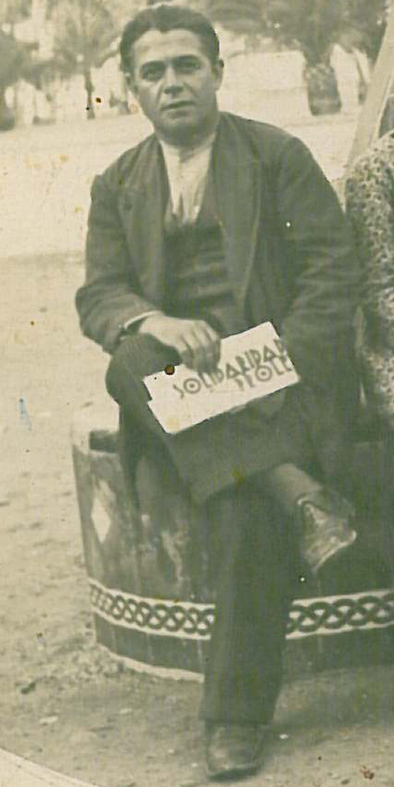 His brother Jose had been the book-keeper for the committee of Cadiz Local CNT Federation. Both were disappeared. We know that José was jailed on 13 August in Cadiz prison. He was taken from there on the 17th, allegedly to be brought to the ‘Miraflores’, a steamship used as a prison-ship. We know next to nothing about that checa, but we do know that he arrived on the ship. We also do not know the date of his murder because he was one of a number of people who were not buried in the cemetery, under their names at any rate. As for Celestino, we know even less. Oral sources have him in hiding somewhere in the city up until he decided to embark on a ship from the Puntales docks. There he was arrested after an act of treachery. Removed to the Falange barracks, his corpse turned up on the Cortadura beach the following day. According to his family, he must have been buried in a mass grave in Cadiz cemetery. Manuel López Moreno was another of the main and most influential anarchists in the city. He had been arrested on the morning of 19 July when golpista troops, once African troops had arrived, took over the Civil Government building. He had been there since noon the previous day. He was one of the organisers of the resistance. What went on in the streets of Cadiz at that time has all the characteristics of the FAI’s insurrectionist approach like the issuance of arms by the authorities, the authorisation of the seizure of armouries and the disarming of golpista military, the calling of a general strike, attempts to break through the encirclement and the notion that, with the coup contained, they could push outwards. López was a 35 year-old waiter born in Madrid. Married to Josefa Ponce Ponce. A leading light of the CNT Local Federation, he was a member of several committees and was a regular lecturer and speaker at meetings at the time. He had been jailed for a number of months back in 1932, charged with obstructing the authorities. He was committed to the Provincial Prison and removed from there to the ‘Miraflores’ on 10 August. We have no further information about him until we come to the burial records of the city cemetery which record that his body, found on the La Victoria beach, had been buried. September 1936 was the month in which the largest number of prominent CNT militants were murdered – 9. They included four regarded by the golpistas as the most outstanding. Some, like Vicente Ballester and Antonio Carrero, as anarcho-syndicalists. Others, like José Duran Román and José López Pedrosa, because they were looked upon as “men of action”. Vicente Ballester Tinoco, a French-polisher 34 years-old in 1936, was by then a veteran anarcho-syndicalist in the city and one of the best known in the Andalusian region and, indeed, across the country. He had served as secretary of the Cadiz Local Federation of the CNT, secretary of the Andalusian CNT and, in May 1936, was a candidate for the national (general) secretaryship of the CNT. Forged in the syndicalism of the latter end of the 1910s, he became the libertarian go-to person in the city. He was secretary of the Andalusian CNT during the insurrectionism of 1932 and 1933. The killings in Casas Viejas and the failure of the December 1933 uprising had prompted him to rethink his attitudes. He was one of the earliest supporters of the suggestion that the UGT be joined in a Revolutionary Workers’ Alliance. In April 1936, a rally held in the Cadiz bull-ring, with Largo Caballero taking part, made a national impact and became a symbol of the need for workers’ unity if the onward march of the reaction was to be resisted. On 18 July, he must have been involved in the meetings held at the Civil Government building, albeit that we have no documentary proof of this. What is certain is that that afternoon he was at the union premises helping roll out the general strike and later, once violence had erupted, according to oral evidence, he took part in the sniping throughout the morning in the vicinity of the Post Office. Later he took shelter in order to dodge certain arrest. For months, he lived in hiding in a range of homes. On the morning of 19 September, he was tracked down to the home of shoemaker Antonio Leal Aguilera. Another anarcho-syndicalist of great renown in Cadiz was Antonio Carrero Armario; he was murdered in September. He was secretary of the Transport Union. In 1936, he was working for the Cadiz Municipal Roads & Works department. A native of Puerto Real, he began to come to notice as a militant during the reorganisation of the CNT in the dying days of Miguel Primo de Rivera’s dictatorship. Under the Republic, he was arrested on several occasions and he supported Ballester in the switch from insurrectionism towards the Revolutionary Workers’ Alliance. He coordinated legal assistance in trials held in connection with the Casas Viejas massacre. His trade union and anarchist activism and his exposure of the Carranza family’s funding of Falangist gangs made him a priority target of the golpistas. He too managed to go to ground for two months. Like so many others, he was flitting from address to address, fleeing dogged pursuit by the golpista intelligence agencies and police. On 31 July, a gang of police burst into his home at No 12, Calle Duque. In the course of a search, they seized books, correspondence and his union membership card. In mid-August, the golpista court authorities issued a charge-sheet against him, an indictment having been brought against him already. In the end he was arrested, thanks, yet again, to information given and on 24 September he was committed to the city prison. He remained there until Sunday the 27th when he was taken out, officially for transfer to the prison in Puerto de Santa María. He never reached it; his corpse – plus another eleven corpses – turned up in the vicinity of the bullring. He was buried the following day. Finally, one of the city’s leading anarcho-syndicalists was Clemente Galé Campos. In 1936, he was aged 49 and had been one of the founding fathers of the CNT in the city back in the 1910s. A carpenter and bricklayer he had served, on and off, on the leadership of the powerful Construction Union. He had also been involved in the launching of anarchist newspapers and FAI groups. Like other CNT members, he had been arrested on several occasions under republican rule. Like his comrades, once the city had been overrun, he had gone into hiding. He too managed to dodge his pursuers for some two months. In the end, on the night of 21 September, a gang of militians showed up at No 2, Calle de San Dimas, where Galé was living along with his partner Josefa Ballesteros and their five children. The attempt to arrest him was very violent. Spotting the militians as they arrived, Galé tried to get on to the roof of the building. Gunshots were traded and the leader of the raiders plus Galé’s 19 year-old daughter, Aurora, were wounded. Later, according to the report from the Municipal Guard, the fugitive had managed to clamber down into an old banger in which he was arrested. As they neared the square outside the Falla Theatre, they used the ley de fugas on him. His body was dumped in the square, where it was found by his partner on her way back home from the nearby Mora hospital where her daughter Aurora had been taken. The burial record, dated the 23rd, states that the corpse had come from his Calle de San Dimas home. The other three anarcho-syndicalists very well known in the city and who were murdered that September were José Durante Román, José López Pedrosa and Antonio Mila Ruiz. All three were rated by the golpistas among Cadiz anarchism’s most dangerous men of action, involved in most of the violence in the city during the life of the Republic. Durante, a seaman by trade, was located on 15 September on the rooftop of a house. According to information supplied by the Municipal Guard, a band of police and militians chased him. In the course of his flight, he jumped down into a courtyard and was fired upon and killed there. Lopez Pedrosa had been arrested a few days earlier, on 11 September, in the Calle Sopranis, at 9 o’clock in the evening. The arrest was made, according to the municipal report, by the Civil Guard. According to the Municipal Guard, he was murdered that very night outside the Civil Government building in the Plaza de España. His body was buried on the 13th. Finally, Antonio Mila, known to the police as “El Gañote”, he was arrested on 21 September in the Calle Porlier in the La Viña district, against the Civil Guard intelligence agency. Jailed in the Provincial Prison, he was taken from there on 23 September, for removal to the Puerto de Santa María prison. His corpse was buried the same day, allegedly having come from the street where he had been arrested. Even though his wife stated that he had been murdered behind the Provincial Hospice. The murders of the main local CNT and anarchist leaders ended in December with that of Andrés Fernando Macías García. 28 years-old, he had been born in Havana (Cuba) and was working as a fitter in the shops at the CASA aircraft plant. He had long been known to the Cadiz Political-Social Brigade. He was charged with having, back in October 1931, having provided the weapon for an attempt on Varela’s life and of involvement in the attempt on the life of the aircraft factor director. His killing was a top priority for the golpistas. He had managed to dodge their pursuit up until November. His home, shared with his girlfriend, was forever being searched. Macías managed to hide out in Puerto de Santa María in the home of the midwife María Ucero Guzmán, who was linked to his girlfriend’s father. As on other occasions, the police received a tip off about his location. One day, Juan José Gonzalez, the head of the Political-Social Brigade under the Republic (he had gone over to the golpistas) showed up at María Ucero’s home with a bunch of policemen. And found him in a room there. He was taken to Cadiz and on the 28th was committed to the Provincial Prison. On 7 December he was taken out, theoretically for transfer to the prison in Puerto de Santa María. His body was buried that same day after it was discovered near the bullring. By the start of 1937, the killings carried out, plus the accompanying terror, had beheaded all resistance and decapitated the political and trade union organisations. However, the killings carried out under the aegis of the WPE (see above) could not go on. The coup’s failure had evolved into a revolutionary situation in the government zone and into a conflict that looked increasingly like conventional warfare. In the area under golpista occupation and even though lots of civil service establishments were in place, there was a certain continuity in the people staffing them and a new state apparatus needed to be created. October saw the creation of the State Technical Council, a makeshift government and the groundwork began to be laid for the golpista courts. Terror Courts which would replace the war-time proclamations were about to come into existence. These Terror Courts placed the repression under the sole control of the military. All arrested persons were handed over to golpista court martials. Meaning the ones that had survived the summer and autumn of 1936, or which thereafter do so. The Terror Courts took off in March 1937; over the remaining nine months of the year, within the areas controlled by the Cadiz Council of War, 456 prosecutions were prepared, leading to the trials of at least 1,285 individuals. Of these, 2223 stood trial in the city itself. 33 people were sentenced to death and 23 were executed. Two of those were CNT members representative of the rank and file membership and of those holding leadership posts. They were José Díaz Mariscal and Modesto Serdio Obeso. Díaz Mariscal, born in 1899, was a carpenter living in the Calle Vidal in the La Viña district and he had a bit of a reputation as a director of carnival groups. A member of the CNT’s Woodworkers’ Union, and having served several terms as bookkeeper for its leadership, he had been arrested several times under Republican rule for putting up posters in the streets, handing out leaflets advertising a strike and getting into a fracas with the forces of public order. Because of all this, he was known to the Political-Social Brigade. Consequently, it was the Political-Social Brigade leader, Juan José González Fernández, who arrested him after recognising him in a queue for bread. He was not charged with anything specific and after time aboard the ‘Miraflores’ and a prison in San Fernando, he was released towards the end of September. He was rearrested on 25 October, now accused of having been implicated in the 18 July 1936 attack on the premises of the Provincial High Court. Reports surfaced accusing him of being an extremist and of having taken part in and incited strikes and social conflicts. He was committed to Cadiz prison and it was there in March 1937 that the Terror Courts moved into action. Díaz Mariscal had the dismal honour of heading the list of the new PSUs (Urgent Cursory Proceedings). His own was numbered No 1. All his numbers came up in the golpista lottery. He was an anarchist, a trade union activist and had taken part in resisting them. The case proceeding along the usual lines. The police made statements to the effect that they had arrested him and they sent word to the Falange, the Requetés (Carlists) and the Civil Guard. In just 20 days, between 8 and 28 March 1937, they had him locked up and tried. The council of war assembled on 19 April. The prosecution asked for the death penalty and sentence was passed. The prosecution did not beat about the bush: Mariscal was a menace to society who had, furthermore, resisted the coup and caused serious upset to the ‘administration of justice’. Four days after that, Seville confirmed the sentence. Mariscal refused to sign the notice of sentencing before he was removed to the barracks of the Cadiz Infantry Regiment on the morning of the 29th. He was placed on death row at five o’clock and, one hour after that, he was shot in a ditch in Puerta de Tierra by a firing squad made up of carabineers. Modesto Serdio was better known within the Cadiz anarcho-syndicalist organisation. A native of Cantabria, he was in his 40s and was a stoker by trade. He had been an active anarcho-syndicalist since the 1920s. Under the Republic, he had been treasurer of the committee of the local CNT federation and a regular member of the CNT Prisoners’ Aid Committees. The police authorities regarded him as one of the most influential members of the local FAI and personally very close to the city’s most prominent CNT members. In July 1936, he had helped defend the La Viña district where he lived. The golpista intelligence organisations searched for him frantically but could not run him to ground. According to his own statement he was hiding out in Chiclana and Medina. Before returning to his home in the Calle de la Cruz. Modesto Serdio who declined to sign the notice of sentence was executed in a ditch in Puerto de Tierra at 6.30 a.m. on 7 August 1937. The execution was carried out by a Civil Guard detail under the orders of second lieutenant Rafael Anarte Viera, the very man who had been in Casas Viejas at the time of the killings there in January 1933. Serdio’s killing brought to an end the initial rash of killings as it gave way to the Terror Courts. Cadiz anarcho-syndicalism had been decapitated, hundreds of its activist jailed or driven into exile. One in four of those named in the list drawn up by the golpista police in the summer of 1936 had been murdered. Others received lengthy prison sentences. Only a few escaped. Some, such as Antonio Delgado Martínez, managed to find their way to the republican zone. Others, such as Félix Ortega Rúa, stayed in hiding until April 1940, when he was arrested whilst attempting to get to Gibraltar. It would be years before the CNT was reorganised in Cadiz. Not until 1943-44. And then it was dismantled again in 1945. But that is another story. In the writing of this article I have used Francisco Espinosa’s book La columna de la muerte (Barcelona, Crítica, 2003), borrowing his notion of “Francoism’s foundational massacre”. For the extermination policies pursued in the city of Cadiz under the WPE and the Terror Courts alike, I have relied upon Alicia Domínguez El Verano que trajo un largo invierno (Cadiz, Quorum, 2004) and José Luis Gutiérrez Molina La Justicia del Terror (Cadiz, Mayi, 2014). The latter text has also been used in analysing the resistance to the coup d’etat. As has Joaquín Gil de Honduvilla Militares y sublevación: Cádiz y provincia 1936 (Seville, Muñoz Moya, 2013). Regarding the burials, I have relied upon the registers of the Cadiz City Cemetery. For the particulars of the lives and murders of the persons named here, I have relied upon Santiago Moreno Tello’s Periodistas represaliados en Cádiz (Cadiz, Asociación de la Prensa, 2008) in the case of José Bonat Ortega . Re the Alvarado Quirós brothers, I have the micro-biography by Antonia Alvarado’s micro-biography (at http://www.todoslosnombres.org/…/…/celestrino-alvarado-quiros). With respect to Manuel Lopez Moreno, I have consulted Causa 130-36 held in the historical Archives of No 2 Territorial Court martial in Seville (hereafter AHTMTS). For Vicente Ballester Tinoco, Jose Luis Gutierrez Molina, Se nace hombre libre (Cadiz, Diputacion, 1997) and Crisis burguesa y unidad obrera (Madrid, Fundación Anselmo Lorenzo, 1994) and for Antonio Carrero Armario, AHTMTS, Causa 128/36, Legajo 131.4535 and http://pacosalud.blogspot.com.es/… / antonio-carrero-ramario.